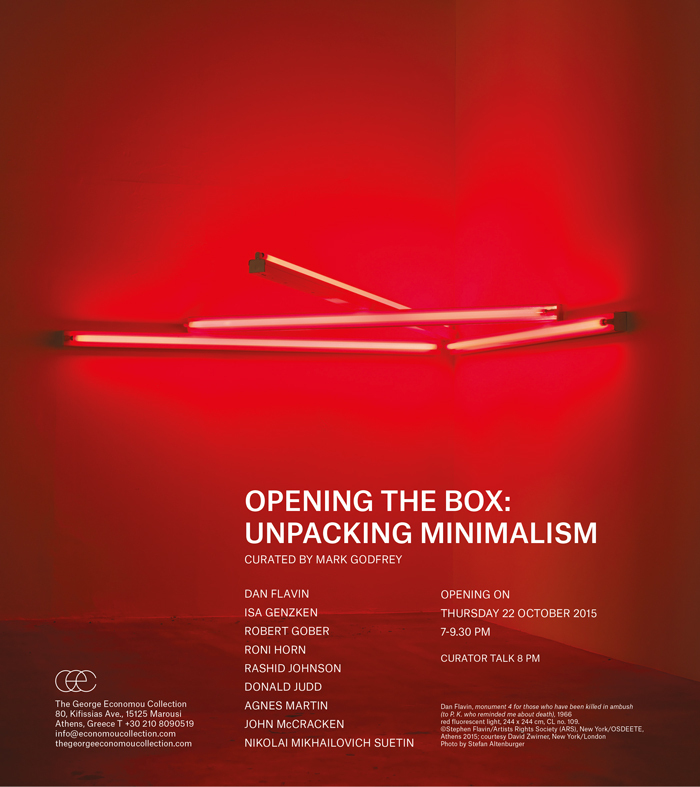 The George Economou Collection is pleased to announce Opening the Box: Unpacking Minimalism. This group exhibition curated by Mark Godfrey, opens on Thursday, October 22, 2015, at the Economou Collection Space in Athens, Greece. When people think of Minimalism, they often think of a generic grey metal box that has been fabricated in a workshop in the United States and is displayed with other similar if not identical boxes. Although this box often features in accounts of Minimalism, it is a mythical, rather than a real artwork. This exhibition of ten works from the George Economou Collection attempts to tell a more nuanced story about Minimalism by looking at a number of different debates, places and time periods. On the ground floor, three works surround a magnificent 1978 brushed aluminium “channel” piece by Donald Judd comprised of six open modular units, an early relief of Judd’s from 1961, a 1966 paintingbyAgnesMartinanda 1988plankbyJohnMcCracken.Thisensemblealreadyraisesseveral intriguing questions: given the compositional ideas Judd’s work shares with Agnes Martin’s, was he mistaken in so often dismissing painting? And how did John McCracken negotiate the relationship of painting and sculpture when he leaned his works between the wall and the floor? What role did colour play for Judd and McCracken, and how did they approach the difference between applied and integral colour? What differentiates these two artists’ handling of texture and reflectivity? German reception of Minimalism in the 1970s: a wooden form created with the use of computers, reminiscent of a javelin or a spear, but lying directly on the floor. On the light-filled top floor, works by a subsequent generation of artists reveal how they turned Minimalism’s formal vocabulary to new ends, addressing desire, loss and identity. Robert Gober’s The Silent Sink, 1984, may evoke Judd’s wall-mounted stacks, yet the representation of a sink and plug-hole introduces thoughts of the body, along with loss, cleanliness and dirt, even disease. Roni Horn’s Untitled (Billie), Untitled (Holiday), 2012, is a cast glass sculpture in two parts. At various times of the day, one will glow in the sunlight, while the other will be in shade—which one can link to the tragic and romantic poles of Billie Holiday’s music. The third work in the space, Rashid Johnson’s Cosmic Slop «Hotter than July», 2014, also carries a title alluding to African American music: in this case, Stevie Wonder’s legendary album as well as Funkadelic’s ‘Cosmic Slop’. In this monochrome, madewithblacksoapandwax,the gesturesthatMinimalismbanishedhavereturned. By the time the viewer leaves the exhibition, the reductive concept of the ‘Minimal box’ will have collapsed in on itself. The show makes clear that a Minimal tendency has existed in art from the 1920s to the present; artists related to Minimalism have worked with a wide range of materials, colours and textures; they have explored formal ideas and engaged deeply with the world around them. For all its supposed coolness, Minimalism can be hot as well as cold: it has many different moods. exhibitions by Christopher Williams and R.H. Quaytman. He is the author of ‘Abstraction and the Holocaust’ and ‘Alighiero E Boetti’, both published by Yale University Press, and several catalogue essays on artists including Frances Stark, Laura Owens, Sharon Lockhart, Rodney Graham, Tacita Dean, Thomas Demand, Albert Oehlen and Fischli & Weiss. He is the curator of the 2015 Turbine Hall Hyundai commission by Abraham Cruzvillegas and in 2015 he was the winner of the Absolut Art Prize for Art Writing.